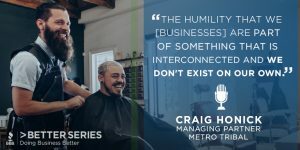 Better Business Bureau has teamed up with Craig Honick, ethnographer and the managing partner of Metro Tribal, to look closely at the consumer-business relationship to help companies understand how better business is being defined by its customers.Tune-in to learn all about the 5 Gestures of Trust. 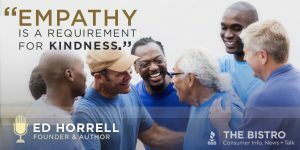 Consumer advocate, founder, and best- selling author of the book, The Kindness Revolution, Ed Horrell, shares his vision for bringing back the values of dignity, respect and kindness to the workplace, schools and everyday life in this inspiring episode of The Bistro. 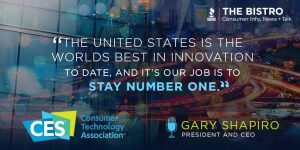 Gary Shapiro, President and CEO of Consumer Technology Association (CTA) joins us on The Bistro to discuss how CTA accelerates growth and progress in our fast-paced economy and supports members who push the boundaries to propel consumer technology forward. We talk self-driving technology, smart cities and the top 10 most wanted tech gifts consumers want to receive this holiday season!